Thought I'd curate this build thread here on ADD, for what it's worth. This is what we started with, an '03 Montero Limited we bought to replace our previous land barge, an '07 GMC Yukon, used to haul around four teenagers and one pre-teen. Four have since flown the coupe so we downsized three years ago to the Monty. This is a third generation for this model, with generations I, II, and II.5 being formidable platforms for vehicle-based adventure. 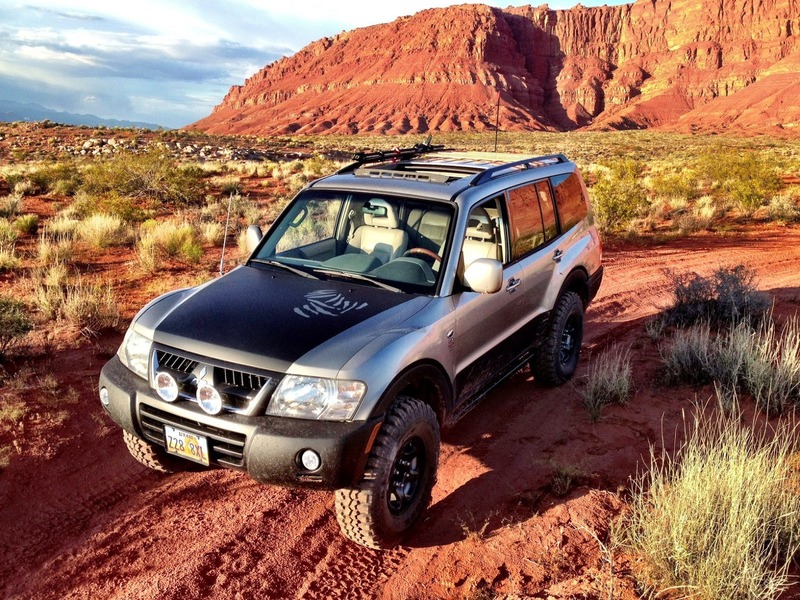 Being an avid follower back in the day of the Paris/Dakar when it actually went there, I became a fan of the Gen III, and, granted, what remains factory in that competition is minimal, the performance and durability of the Gen III's platform won me over. I've owned two, my first an '01. The main issue with the Gen III is there's very little aftermarket support. It thrives as the Pajero in Asia, Australia and Europe, but fizzled here in the States. Mitsubishi missed the marketing train on the Paris/Dakar victories, an opportunity to position the Montero nicely against British and other Japanese offerings, not to mention the big three's SUV inventory. Instead they focused on AWD rally cars with Subaru in their sights. Not to mention Mitsu's almost devastating $0 $0 $0 campaign from which they're still recovering. This not only made the Montero a wall flower, it squelched any incentive for aftermarket development for both the Sport and full-size platform, a good thing for purchase price, and the bane for anyone looking to modify. Stock, the Montero already has a robust drive-train, some models with standard limited slip differential, and respectable nine-inch ground clearance. Outward visibility is terrific, rearward by comparison is great, and the cabin is well-appointed and thought out with one of the largest sunroofs offered. Apparently Mitsu figured the American market would stick to Jeeps, leaving the Gen III Montero with plastic bumper caps and a departure angle rivaling UPS trucks. Aftermarket wheel offerings are limited given some models' air pressure sensors and the V6 has a tendency to pressure oil through the rear main. 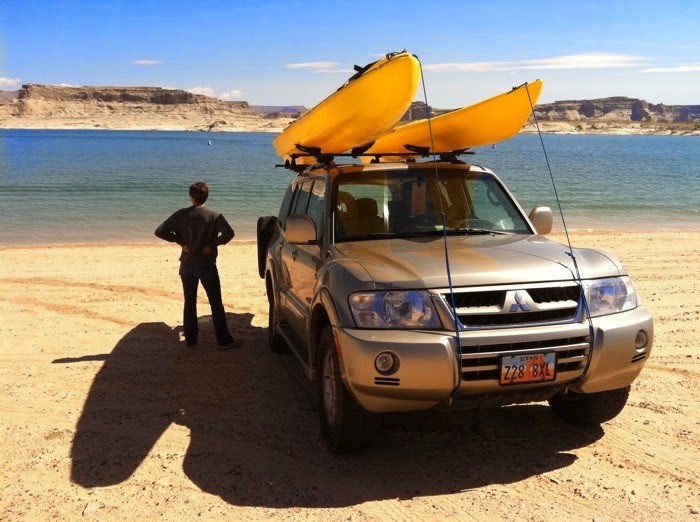 We wanted a good sized SUV to support our kayaking and camping habits. I loved the driving position and handling characteristics of the Monty along with the room, interior design and appointments, the massive sunroof, and its limited-slip 4X set-up. It's genealogy begins in a rental car fleet in SLC, Utah, then to a private owner, traded to a dealer where I found it. It's only flaw was a non-functioning seat-fold mechanism on the middle row. I had it repaired and it has since busted again with the same M.O. My first one did the same thing. This is what we ended with. I ended up selling this Monty during a bit of a crisis, and I regret doing so. I initially replaced it with an '07 Hummer H3 and have since replaced the H3 with a 2.5 Montero Winter package, satisfying my longing for a great adventure platform. The most viewed mod on the build blog is the Old Man Emu suspension upgrade giving the Monty the lift it needed, not easy to come by since it ships from Australia (at the time of this build). I measured wheel well and ground clearance. Thirteen inches from the ground to the rock sliders and three inches in the wells. In retrospect, I should've just measured to the center of the hub, simplifying hte process, but, hey, we learn along the way. I began with the front, removing the battery and tray on the driver side and the air box on the other, making access to the three nuts on top of each strut tower. Next it's necessary to remove the top A-arm. Remove brake and traction-control lines from the support on the arm. I then used a breaker bar and a 22mm socket to free the bolts for the A-arm and the strut tower mount and then removed that assembly. I disassembled the strut assembly using spring compressors to take the load off the top of the strut tower, allowing its removal. I kept track of the order of the strut hardware for reassembling the new strut and spring components. To do so, the new spring needs to be compressed. I made the initial mistake of not placing the spring compressor hooks at the farthest point on the spring and failed it compress it enough to get the strut nut to bolt on top. When I repositioned the spring compressors I found I didn't have enough length, nor could I torque them enough to adequately compress the spring for the installation, so I took everything to a garage where I had them assembled. Installation is straight forward, install the strut tower and secure the three nuts on top, attach the strut assembly to the lower A-arm, and then reattach the upper A-arm. Be sure to toque all bolts with the suspension loaded, that is to say, place a floor jack under the lower A-arm assembly and raise the assembly until its travel removes the suspension chassis from a placed jack stand, loading the A-arm assembly with the vehicle's weight. Torquing to specs this way eliminates damaging the bushings. I was able to do the front install in about three hours with the Montero parked half-way in the garage to avoid the rain. I did the rear install in the driveway since the lift would have exceeded the height of my garage door. For the rear spring and shock removal, the vehicle needs to be raised to a height adequate enough to drop the lower control arm far enough down to allow the spring egress. I started by removing the nut at the top of the shock tower, then the connecting bolt at the lower control arm, and then removed the shock. Then I loaded the suspension assembly by lifting it with a floor jack using a short 2X4 underneath the arm. With the spring compressed I removed the bolt holding the arm and the hub assembly together, and then carefully lower the jack down, unloading the arm and allow the spring to drop out. Assembly was done in the opposite order, being sure to roque all bolts with the suspension loaded as above. Done in about two hours. The key to this was the height of the vehicle allowing the spring to come out freely once the control arm was dropped. 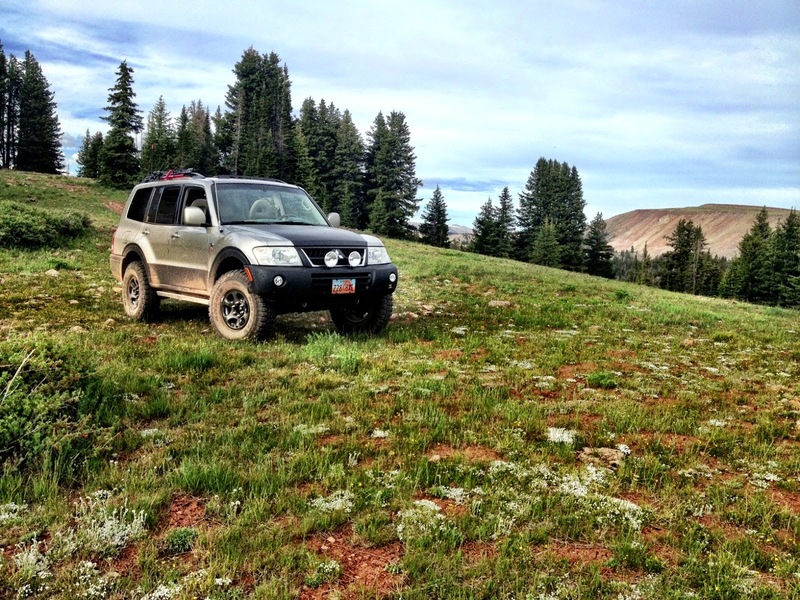 Once I seated the suspension on a short test drive I measured at the wheel well and from the ground to the rock sliders and realized a gain of two and a half inches. In driving, gone is any hint this was a luxury SUV. More feedback at the wheel, stiffer response, quicker turn-in, all providing a sense of being better connected to the road and trail. Having driven my share of westward returns at golden hour I've wanted to black-out the hood getting rid of that double whammy reflection. The contour of the Gen III's hood lines flow nicely to the grill leaving the popped round fenders to flank the black, framing it up nicely. I googled the graphic and projected it on a wall where I hung some newsprint. ...and cut it out of the newsprint creating the template. ...and then trimmed the mask through the template. I masked the rest of the hood and removed it, suspended and shot it with Dupli-Color flat black trim paint, three coats. 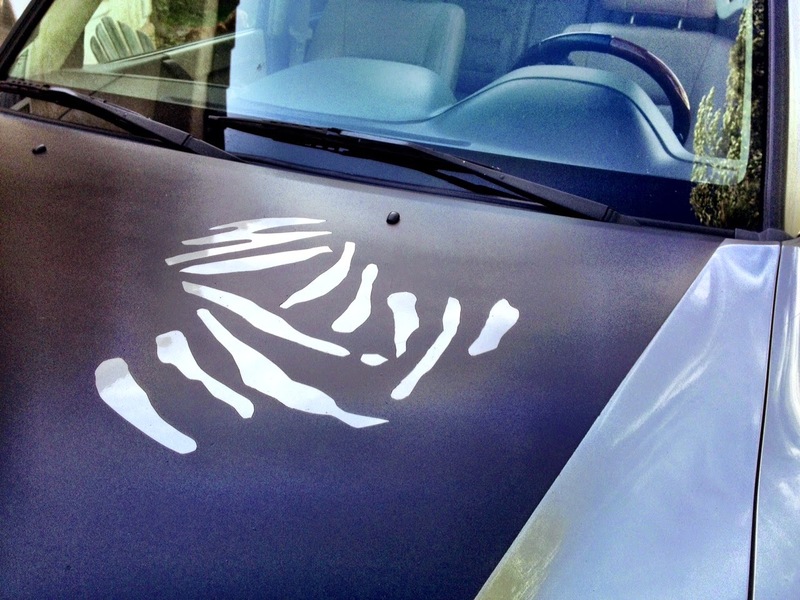 Peeled off the masking. And this is the result. I also shot the rest of the grill to blend the lines form the hood. I had previously painted the grill insert. Be sure to seal the blackout with a flat clear coat. The rear door storage on the Monty doesn't serve much purpose save for a poorly designed way to stash headrests from the third row seat and a narrow but deep pocket for stowage of small items. I have a few Pelican cases no longer being used, so I thought to adapt a small case, the Pelican 1400, using it for a first aid supplies container, installing it onto the door replacing the pocket. While at it I picked up some Quick Fists to mount an ax, using the door pull hardware, where it'd be readily accessible. I completed the door modification by adding two more QuickFists to hold a collapsable shovel, along with an ARB flat repair kit that fit well into the space with more velcro to prevent rattling around. A Maglight and a fire extinguisher round out the job. 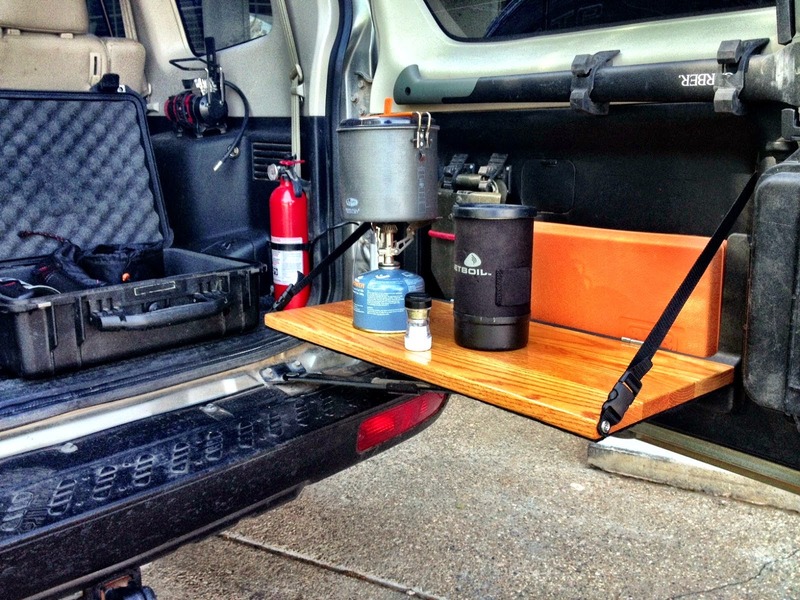 A year after this mod, we've been for want of a work surface, a place to make lunch and such while on the road without much set-up when we stop. After the above mod, I saw that there's room to attach a shelf onto the steel reinforced pocket that once held the headrests for the third row seat when stowed. I removed the panel and replaced the remnants of the straps that held the headrests in place with ones that I salvaged from an old day-bag back pack that have plastic quick release couplings. The straps were cut to length long enough to suspend the shelf at a right angle to the door and be adjustable. I fed the straps through the existing slits in the panel. From Lowe's I picked up a 1"X12"X2' oak plank, sanded and finished it the same way I did the roof rack, and glued a black felt backing onto it. Installed hardware and riveted it to the pocket. The plank is stowed with a gray elastic strap from an old cooler. I pulled off the plastic body cladding and decided to coat the exposed area with a bedliner, Duplacolor's Bed Armor with Kevlar. Got the kit on sale at Autozone for $75. To prep out, I thought I'd fill the holes left by the cladding. I ground (grinded?) out and reamed each with a Dremel tool. Filled each hole with a fiberglass filler. Use this sparingly to save yourself an enormous amount of sanding. It's been too long since I've done body work, and trying to beat the setting filler I got sloppy. I filled those that didn't with a Bondo filler, and sanded it down after setting. 80 grit. I didn't finish-sand knowing the liner would make it a moot point. After cleaning everything up, I masked the bodywork and removed the bumpers. I shot the grill and the driving light holes with the same bumper-black I used on the upper grill, knowing that I didn't want the hassle of trying to coat those areas with the bed liner. The liner went on in two coats as per instructions. I used a little over a third of the product. I'm not sold on it yet, though Mrs. Saint likes it a lot. Had I to do it over, I'd have finish-sanded the body work and shot the whole skirt and bumpers with bumper black, but that would've been more for aesthetics than function. Considering how we use the Monty off-road, and the amount of desert pin-striping we're accumulating, this will provide some protection. Throw on the Big Horns on the Mitzu steelies and I'm sure I'll like it better. So, it's growing on me. It looks better photographed than live, and the farther away the better. While I was at it, I decided to take care of another issue we discovered during our Three Hour Tour. When the Monty failed to climb and we reversed back for another try, the flanges (not sure what to call them, maybe a spoiler-type thing) that extend on the bumper in front of each front wheel acted as scoops, dragging back mud and rocks with us. So I hacked them off with a jigsaw. I've considered alternate roof racks but for the time being want to put the serious money into suspension and recovery. The stock rack has served its purpose fine with a Thule system that holds the RTT and awning, but I want a tray in between the stanchions to hold other recovery and camping gear. To this end I removed the headliner. It's pretty straightforward, removing all the hardware of grab handles, interior lighting modules, sun visors, etc. The only hang up is in removing the sun visor clips with tabs that tend to break easily. Remove the weather stripping on all doors. The A-pillar covers snap out being careful to keep retention clips in place, and second row seatbelt mounts on the B-pillars need to come off to remove the covers. The rear covers that surround the wing windows between the C and D-pillars snap out, again being careful to keep the retainers in place. ...and then the main connector that attaches behind the driver's side footwell panel. The dead pedal needs to be removed to access this. There are a number of attachment points along the route of this cable, the first of which is just above the main connector, the rest of which on the A-pillar are taped into place. Carefully remove the attachment points and feed the cable up behind the dash to the A-pillar junction being carful to route the cable so the connector egresses without snagging. Sounds harder than it is to remove. With the cable free, remove the headliner. Next out is the rear AC/Heating ducts, eight screws total holding it in place. It's U-shaped around the cargo area with a air-feed tube that goes up the passenger D-pillar. With the ceiling cleared, the five nuts per side can be located, two at the rear and front and one in the middle. Remove the nuts and the racks pop right out. I considered a number of materials to use for the cross-members and settled on 1/2"X3"X4' oak planks from Lowe's connected to 2.5"X1 and 3/8" Stanley zinc plated mending braces attached with Arrow 3/16" aluminum rivets with 1/4" grip. I wanted to allow varied placement of the Thule Crossroad Railing Feet while keeping the cross-members close enough to create parallel support to prevent sagging. I came up with 3" spaces between the 3" planks giving me 6" centers to mount the mending brace, resulting in room for five cross-members. With the braces attached, I remounted the roof rails and reassembled the interior. With these back in place I measured the width and cut down the oak planks to 41 and 5/8" in length, and mitered at the ends to fit the 22.5 degree angle of the stock rack. I test fit the planks, fitting them underneath the mending braces to mark the holes, a pair on each end, to attach them. I number each plank to correspond to their position on the rack. I stained and varnished the planks with a marine-grade product, three coats taking a couple of days. With the varnish set on the planks I finished the rack install. For the most part everything lined up well to the brackets. I secured them with 8-32x1" stainless steel flat phillips machine screws and nylon-insert stainless lock nuts. I wanted the top to be relatively weather protected and nicely finished using stainless finish washers. The oak allows me to mount stuff like RotoPax and MaxTrax mounts. A set of desert tan ones might look pretty good up there. 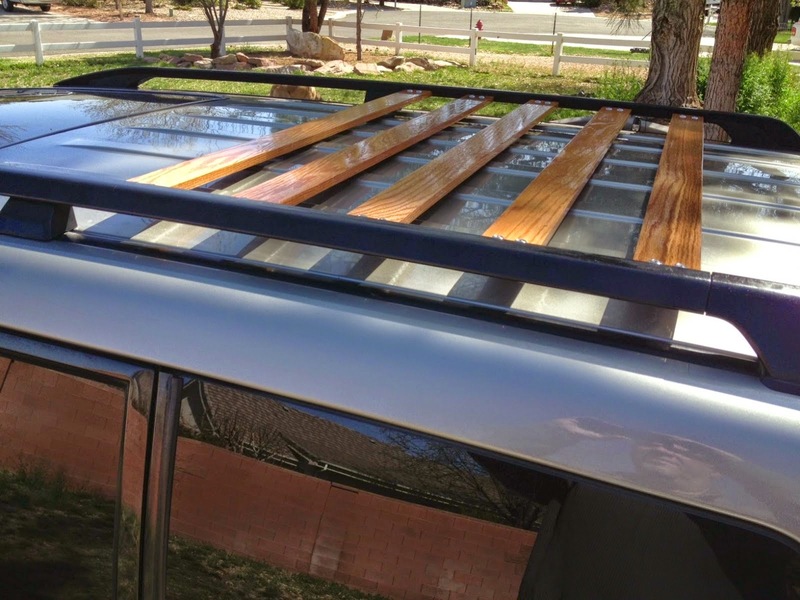 I noticed after I had installed the brackets and replaced the rails that I could've done another two slats bringing the edge to the sun roof. Not sure what I was thinking when I initially thought-put and measured the project. If I can't live without them, I'll add two more. Some day. This gave cargo area 26" X 41" within the footprint of the rack. The clearance at the arc of the top is 3/8ths with a 1/4" from the elevated rail. The slats will sag with a heavy load so I may wedge large rubber grommets between the slat and the rooftop when so loaded. My concern was that this would come off "Clampett-ish" after the Beverly Hillbillies, but I'm more pleased that it's a bit cross-culturally reminiscent of a Woody or surf culture and I'm fine with that. Thanks for sharing your build here, makes me wamr to get to work on mine.